Today I want to show you the card I made over the weekend. I chose colours that I wouldn't normally choose. I mean, I used black! And bright green. Definitely not the colours you would see on my cards often. I combined these colours with pastel yellow. And I was surprised that I actually liked this colour combination. I didn't use any DP not any cute images on my card. Strange, huh? I did use my favourite quote stamp though. Are you curious how this card turned out? Ok then, let me show it to you. Tadaaam! As I said, I didn't use any dp. For my background I just used a pastel yellow paper, over which I stamped with Stampabilities' Faded text background stamp. And the yellow paper on the left is embossed with Cuttlebug Fleur de lis embossing folder. I also used my border punch and some ribbon from my stash. And the stamp is from Cloud 9 design. I hope you like my today's card and that it'll inspire you to do/try something you don't usually do on your craft projects. Oh, and before I leave, I have to do one more thing ... I have to announce the winner of my candy. 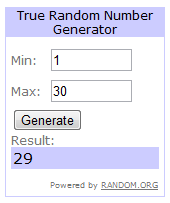 Well, I left Mr. Random do his thing and he chose number 29. There were originally 31 entries for the blog candy, but one person didn't follow the rules so that link was removed. So much from me today. I wish you all a wonderful week! OOH this is nice and Zingy , fabulous stamping on the sentiment too well done Cebelica Hugs Elaine . Beautiful card in those bright colors paired with black. I like that the sentiment is the focal image and the text bg is super. Congrats to Sassy on winning the blog candy. I love it!!! Thanks for participating in MY HEART PIECES challenge this week!! Wow Cebelica this is beautiful I love the colours and design the sentiment is super. You did an amazing job for being out of your comfort zone! LOL!! Turned out just beautifully and I like that lime green and the black for contrast. Striking! Hugs! This is so gorgeous with beautiful color.Thanks for joining with us at My Heart Pieces. Fantastic card. So great design with fabulous colors. I like it. Thanks for sharing.